Catch bugs under the grass to get the nicest prizes with Beetle Mania Deluxe slot! This is a very amusing slot with some lovely bugs and other little creatures. They all help you to get some nice prizes. Although this is not the slot machine which you can win the highest winnings with yet it offers a pretty good and entertaining gameplay. So do not worry, we are sure you will play for a longer time than you have thought at first. This slot machine is made by Novomatic. As everyone knows, games presented by Novomatic are always excellent so this guarantees an awesome game and quite good graphics. In the background, some musical instruments can be seen, such as a violin, an electric guitar, a violin, etc. You might think cartoons are for kids only but give this slot machine a chance, you will not regret it! 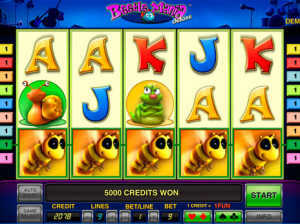 Beetle Mania Deluxe slot has 5 reels, 3 rows and 10 lines and offers some cool features to make you even happier. First of all, let's talk about the lovely symbols which can be seen on Beetle Mania Deluxe slot. You will like these cartoonized creatures for sure! There is a little bee with huge black eyes. If you can land this symbol, we have good news because it substitutes for all symbols except the musical note and the ladybug. Speaking of these two, there is a nice feature when you have a very lucky spin. If you land 3 or more of the musical note, which is the Scatter, you will be awarded with 10 free spins. Isn't it amazing? One more note, these Scatters need to go from the left to the right. The other one is related to the ladybug which has a weird blue skin. If you land it, your prize will be immediately doubled. The only downside of this slot is that bonus games cannot be retriggered during free game. On the other hand, during this little journey in the nature, you can meet a green butterfly, an orange snail, an angry centipede and of course, 10, J, Q, K and A symbols. Another great feature appears after a lucky spin. There is an opportunity to gamble a little bit more. So, when you can land a cool winning combination, click on the Gamble button and you will see a flashing card. Your task is easy: determine whether the next card will be black or red. You can see the prevoius cards above the big card. Click on Red or Black and then the card will immediately reveal the truth-if you were right, you have just doubled your prize, congratulations! However, if you were wrong, you have just lost the actual winning. You can collect your prize anytime after a successful round in this mini game. After a wrong decision, the mini game ends instantly. We recommend Beetle Mania Deluxe slot to anyone who wants to spend some quality time and have some fun. Try your luck now, place a nice bet and enjoy Beetle Mania Deluxe slot!